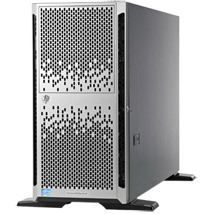 HP Proliant servers have long been the IT administrators' choice for high-end storage because of their flexibility and low-risk. These servers have been known for their high quality components dating back to when they were the cornerstone of the Compaq server line. But as with all servers, whether SAN, NAS or RAID, they are subject to data loss. For many of these machines that have been in service for more than five years (and sometimes less), hard drives fail, and difficulties can occur that render their contents at risk. This page outlines our experience and provides an overview of our HP server recovery services. If you are having difficulties with your HP or Compaq RAID array, please feel free to call us at the toll-free number above, or click here for our RAID consultation form. When you have encountered data or drive loss on your HP server, we can help you in one of two ways: with remote recovery, and with in-lab data recovery. Remote recovery of your HP or Compaq server basically consists of our data recovery engineer logging on to your server from our lab. This is typically completed on a block level to a web-connected server, and is available in situations where multiple drive loss has not occurred. The benefits of this service are numerous: it tends to be very inexpensive, it requires little intervention on your part, and the process is usually carried out very quickly. In more advanced situations where remote recovery is possible, we may require you to perform simple on-site tasks, such as copying data from your server to another device, but in general our engineers perform over 90% of the work. By contacting us at the toll free number above, you can discuss your options with a recovery engineer. Assessing your case will provide us the ability to explain what will be necessary to retrieve your data and bring your server up to 100% functionality as quickly as possible. Click here for our RAID consultation form. Remote recovery is not always possible, however. When your RAID array has lost more than one drive from the set, in-lab recovery is almost always necessary. All RAID servers offer a high level of redundancy to protect your data, and ProLiant servers are no exception. But, when multiple drive loss occurs, that redundancy is put at risk, along with the server's data. When your server requires in-lab data recovery, our engineers work on your failed drives in a safe, particle-free class 100 clean room (explained here). To begin the process, we use imaging and cloning procedures to ensure that all data from the failed drives is kept completely safe. From there, we rebuild the server array using proprietary tools that ensure file and block corruption are eliminated. Once we have rebuilt the server to its original functioning state, we rush ship it to you immediately. When it comes to recovering business servers, we focus completely on data safety and security. All server cases are handled as a top priority, ensuring that your company sees as little downtime as is possible. We understand that your HP server is critical to your operations, and we act accordingly. We take your data safety very, very seriously. Until the end of 2014, Hard Drive Recovery Group offers free 24 hour drop shipping to all its server recovery customers. This service often enables our clients to have their server back and fully functioning within 24 hours. Please call us for more details. HP or Compaq ProLiant servers can display a number of errors, but the most common ones that can be quickly remedied are listed below. This error is reserved for ProLiant systems with a Windows Operating System. Fortunately, this has been recognized by HP and Microsoft, and a simple solution is available. According to both companies, the best way to restore service is simply to install Windows Service Pack 6, which is available at the Microsoft website. Of course, this fix does not always work. If your server's boot process cannot get to the point where this service pack can be correctly installed, we recommend calling us before proceeding with any other action. - Advance Power option --> change to = HP Static High Performance Mode. If there's one thing that separates HP and Compaq RAID servers from many other manufacturers, it's flexibility. An example of this is when the Drive Fault LED is lit. When you face this situation, it is often likely you can install a new drive into the server, without any issue. This is due to the ProLiant's high fault tolerance. On the other hand, when you have Multiple LEDs lit, you must exercise caution. This often indicates that more than one drive has failed, in which case it can be extremely dangerous to your data to attempt to install a new drive (often, this task will not be possible, but we've seen determined administrators do this!). Simultaneous hard drive failures within a RAID array is uncommon, but does happen more often than you would expect. This is often due to the age of the hardware (these servers do tend to last at least 10 years), a power surge or other configuration issues. In cases of multiple drive failure, in-lab data recovery is almost always the only solution to retrieve the data from the HP RAID configuration. This is the case whether you have a SAN, NAS, or basic RAID configuration. Our advice: NEVER attempt to reinitialize a server that has experienced multiple drive failure without either contacting a data recovery engineer, or at the very least, HP customer service. Please call us on the toll free number above if you experience this. While it is true that often you may see "unknown error" when you have failing hardware, this is not always the case. Often, this is the sign of an operating system issue, or a problem with the RAID array's configuration. If you experience this kind of error, caution is warranted. Many of our past clients have approached an HP "unknown error" aggressively, only to cause their entire RAID array to fail. Remember in these cases that reinitializing your array can in fact be the most dangerous thing you can do. Instead of opting for an aggressive approach, record any and all error codes and call one of our data recovery engineers immediately. There is never a charge for the call, and we have found that it often saves our customers thousands of dollars in time and effort. As a certified HP partner, we support not only the wide variety of currently available HP ProLiant and Integrity Servers, but also the full Compaq ProLiant product line as well. Basically, if it's branded with an HP or Compaq insignia, we've recovered data from it. As well as many other Compaq-branded servers. Hard Drive Recovery Group RAID specialists offer both hardware expertise and in-depth software knowledge to every job, and we have been working with Compaq and HP servers since the 1990s. Our clients have experienced some of the highest data recovery rates in the industry, and continue to return to us. If your HP ProLiant server has crashed, consider a professional opinion first. Contact us here, or at the toll-free number above.